So, let’s talk pancakes today! Above is my standard recipe, but today I made changes. 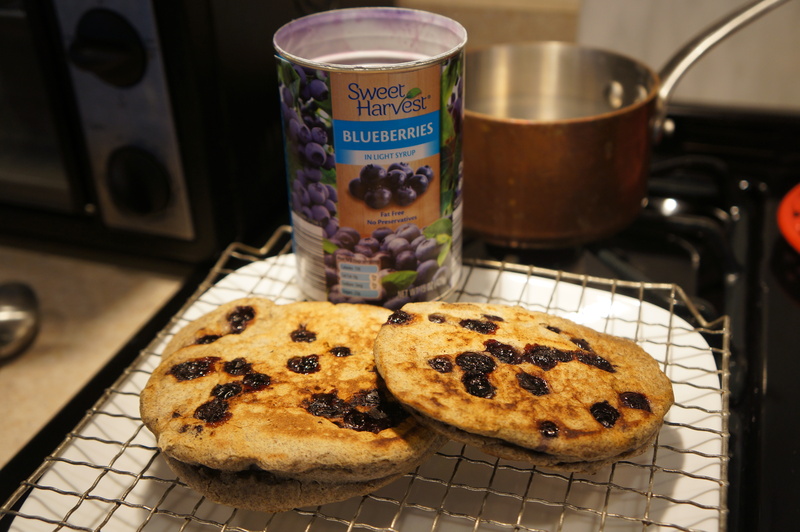 I used .5 C of 3 different flours to get the 1.5 total (oat flour, unbleached wheat, and spelt) AND I found canned blueberries at Aldi. I also eliminated the sugar, milk, and butter. Instead I used some pure maple syrup and 1/2 can coconut milk mixed with water to make about the same amount of liquid. Then I got the cast iron skillet coated in farm lard and butter and really hot. Then I poured in some batter and then placed the blueberries in, dotting them all over. The nice thing about this recipe is it is very adaptable. The blueberries were juicy and soft and worked really well here. Give it a try!